LucasArts may be ready to drop some new downloadable content for Star Wars: The Force Unleashed, as five new Xbox 360 achievements have expanded not only the possible gamerscore, but the game's character roster as well. Warning, spoilers ahead. The five new achievements boost the Star Wars: The Force Unleashed achievement count from 1220—220 of those points added alongside the Jedi Temple Mission Pack DLC—to 1345 points. Thing is, LucasArts hasn't publicly announced that new downloadable content. But it appears it will soon. 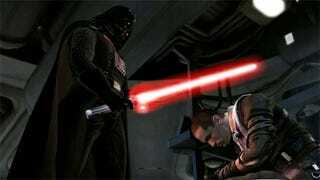 The spoiler-filled possible new additions to The Force Unleashed are after this. Nice Die Hard reference, guys. And way to fulfill our Gonk Power Droid torture fantasies. We've contacted LucasArts to get clarification on these new unannounced additions, but haven't yet heard back. That may be because the new DLC announcement was planned to be made at next week's Comic-Con Star Wars Spectacular keynote, possibly one of the "world exclusive announcements" the publisher has planned. Thanks to Brandon for the tip!